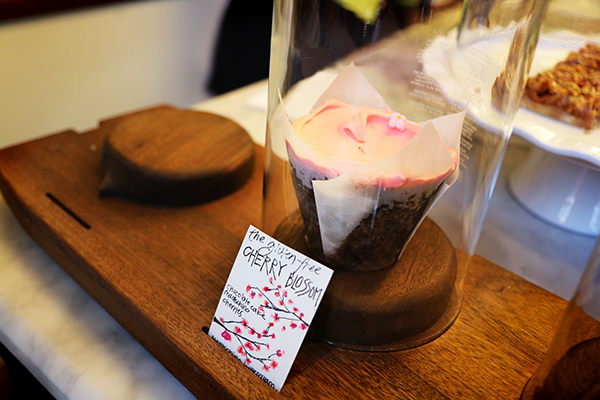 The cherry-themed cupcake at Baked & Wired misses the mark. For once, head to Georgetown Cupcake instead. Cherry blossom petals will soon be sprinkled on the sidewalks, the grass of the National Mall and every tourist’s car parked along Constitution Avenue. While these trees don’t actually have cherries on them, there are plenty of restaurants across the city with cherry-inspired foods and drinks that you can enjoy in the fruity spirit of the season. When it comes to cupcakes, you should usually steer visitors away from Georgetown Cupcake and shepherd them to Baked & Wired. But for a cupcake with the best, most palatable cherry flavor, the Tidal Basin tourists may have it right. This signature cupcake includes dried cherries that complement, instead of distract, from the dessert. Sometimes the bottom of a cupcake is boring, but these additions give the cake its primary flavor, balancing out the sweet, creamy frosting with a slightly tart bite. Georgetown Cupcake sticks to its simple style by not trying to create a full-on cherry cupcake, but offers one that gives you just enough of the berry while maintaining a balanced taste. Sprinkles is normally the happy medium between the extreme popularity of Georgetown Cupcake and the hipsterdom of Baked & Wired, but unfortunately has little to offer as a fulfilling cherry experience. All of the flavor is in the batter, which makes their seasonal cupcake boring. And the cherry-blossom pink frosting tastes no different than their regular frosting, either. Usually the best place for a well-balanced cupcake, their cherry blossom cupcake has too much cherry going on at once. The frosting is cherry, the cake is cherry and there are cherries baked inside – resulting in a baked mess of flavors that alternate between sweet, sour, creamy and chewy-cherry-crunch. Unless you are craving an overloaded cherry experience in one cupcake, skip out on Baked & Wired until the crowd clears out in a couple of weeks. With the appeal of an elegant date night – minus the tablecloth and fancy waiters – Belga Café offers an excellent cherry blossom prix-fixe menu. Pay $45 for an appetizer, entreé and dessert, and you’ll be sure to get your cherry fix in more flavors than you’d expect. The cherry and Brie crostini starts you off with a layer of textures that emphasize the tart, dried cherry. The crostini is not overwhelmingly stiff, with a well-roasted bottom layer crunch. The Brie dominates the top half of the bite: naturally creamy and melting into the cherry middle, the two distinct flavors merge well. Pan-seared duck breast has enough flavor on its own that the cherry doesn’t dominate like it might with chicken. Instead, the cherries paired with the tender duck are powerful but allow the bird, normally priced at $26.95, to bloom. The best part is the cherry beer sauce that is not strong in flavor, but sits very well, leaving a pleasant, dark cherry aftertaste. It goes well with the rest of the dish: salsify cigars (a type of root vegetable) with tomato add to the color palette, and vegetable couscous is a welcome addition. The cherry tart is actually just a pound cake served with yogurt ice cream, but there is a lot more nuance to it, which might place it in the running for your favorite cherry blossom season dessert. The sweet cherry-lavender red wine syrup is generously drizzled across the plate in a checkered pattern to present the dish, earning it many style points. This article appeared in the April 6, 2014 issue of the Hatchet.